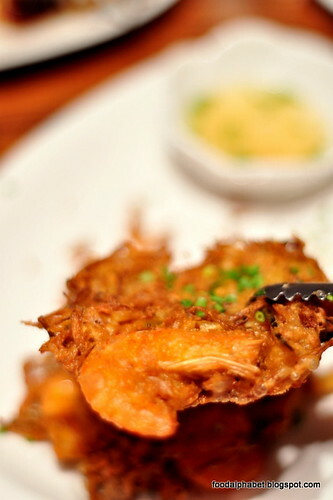 Now let's take you to a journey of great mouthwatering treats sure to tickle your taste buds, an appetizing treat we start off with Shrimp and Vegetable Okoy (P160), tasty shrimp and vegetable strips crisp fried in light batter, and served with garlic-vinegar dip. 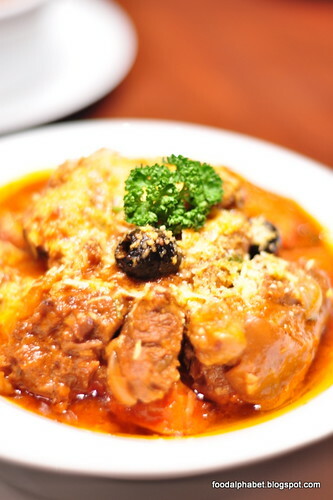 Rarely do you have this served on the menu of most Filipino restaurants, Chef Tatung ventures into delicious territory and this is definitely a must-try. 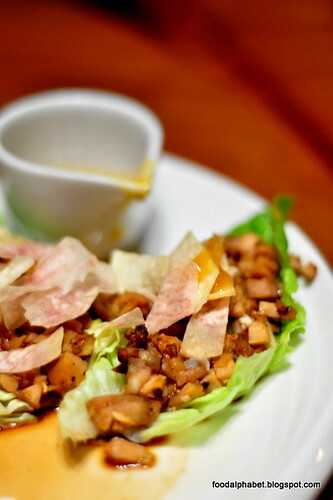 Another must-try is this Chicken Sisig Lettuce Wraps (P330), taking inspiration from a Chinese dish favorite, the minced pork with lettuce wraps, comes a healthy alternative to sisig. A mix of minced grilled chicken, onions and green chili with taro chips served on lettuce leaf bowls, with mango dipping sauce. 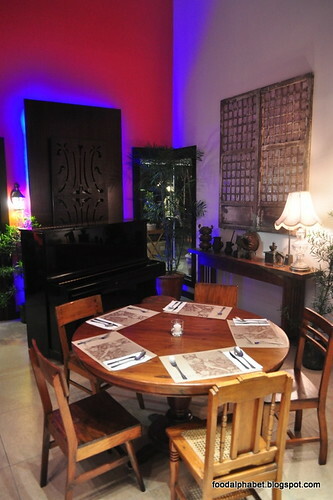 Exciting, salivating and a great way to start your dining pleasures. The mango dip complements the kick of spice that makes you look forward to every bite. 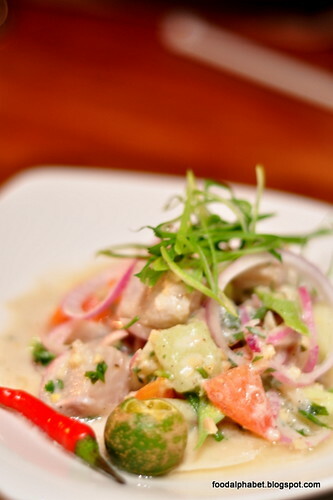 Fish Kinilaw (P280), Tasty bite-sized chunks of fresh Tanguige, marinated in native vinegar, tossed with diced cucumbers, tomatoes and onions. 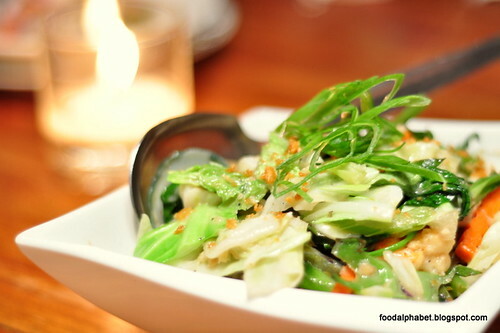 A favorite Filipino delicacy, much like the sushi of the Japanese, but tastier! 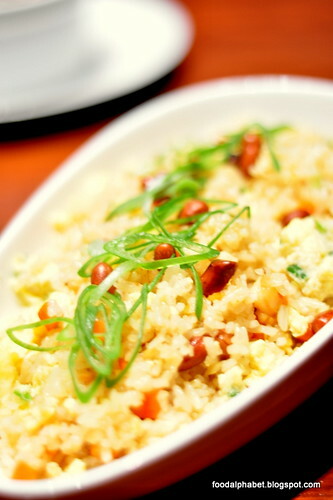 Tatung's Fried Rice (P210), loaded with shrimps, vegetables, peanuts, egg and spring onions, is definitely the rice, perfect for all of Chef Tatung's creations. 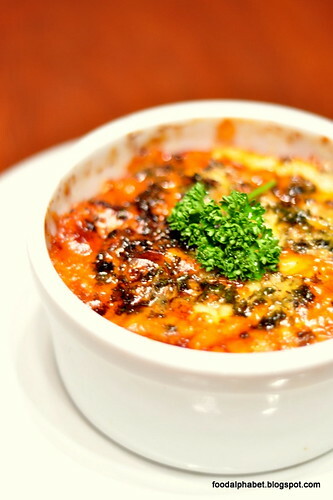 Pokipoki Gratin (P340), An Ilocano classic for modern diners, with layers of grilled eggplant mixed with egg, tomato and Vigan longganisa then slathered with carabao mozzarella cheese. Now that's a mouthful, indeed that's you would feel when you have a taste of this fascinating dish, there's just so much to taste in just one dish. 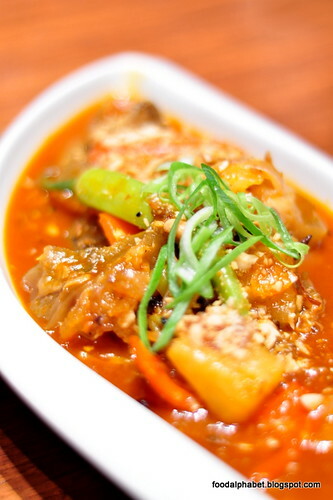 Kalderetang Kambing with Quezo de Bola (P650), tender goat meat ragout cooked in a mild spicy tomato sauce with mushrooms and pickles, garnished with grated quezo de bola with baby carrots and potato marbles on the side. 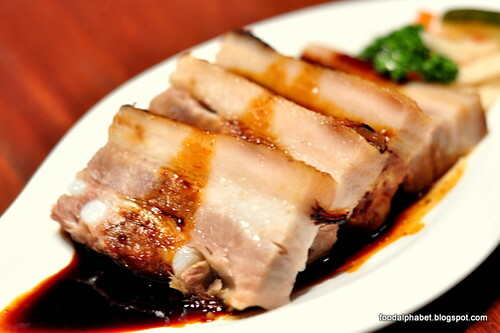 Honey Glazed Slow-Roasted Lechon (P520), definitely a favorite of meat lovers, the succulent tender slices of pork belly, coupled with flavorful juices, cooked in a bed of garlic and lemongrass, sitting for 6 hours on a brick oven, brings out the flavor that has gotten us in a love and hate relationship with pork. 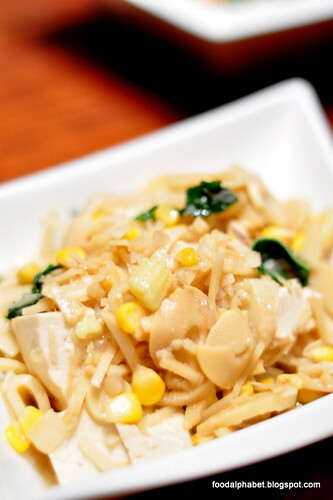 Kabute, Labong at Tokwa (P290), stir-fried oyster mushrooms, bamboo shoots and bean curd with sweet corn and saluyot leaves. My mom would definitely love this. 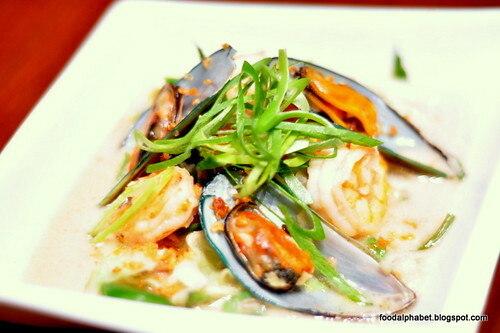 Seafood Gising-Gising (P340), mixed vegies and seafood tossed in spicy coconut sauce, a whole new way to enjoy your vegies, spiced just right! 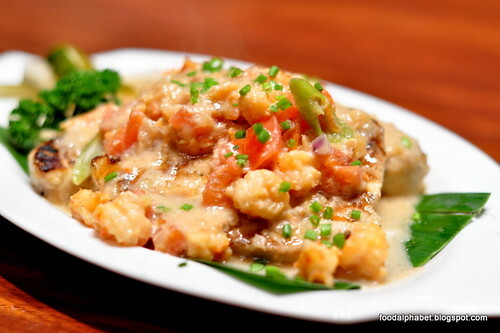 Grilled Gindara in Mama's Coconut Cream Sauce (P540), Chef Tatung's take on his grandmother's recipe, grilled to perfection and served with a special sauce made of minced ginger, onions, finger chilies and tomatoes, cooked in coconut milk with shrimp bits. The smell of it makes me all excited, as I took a bite, juices came out with a hint of coconut which made it oh so sweeter. 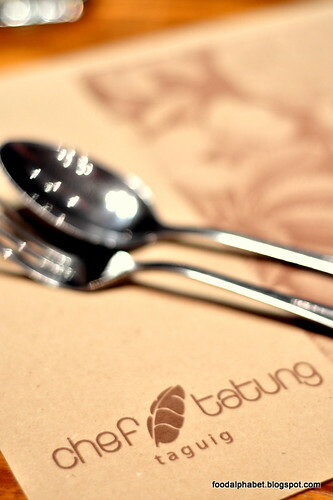 Chef Tatung, you have made your grandmother proud. 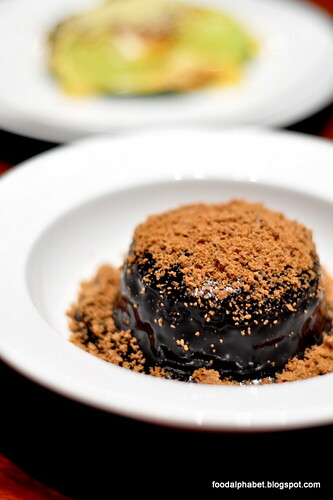 For dessert, don't ever leave without ordering dessert, I can take on the Warm Tsoknut Chocolate Cake (P100) anytime! This just caps our dinner perfect, chocolate moist cake with Tsoknut crumble, you will be back again for this, I guarantee. Love Pichi-Pichi? Then you're gonna fall in love with this. 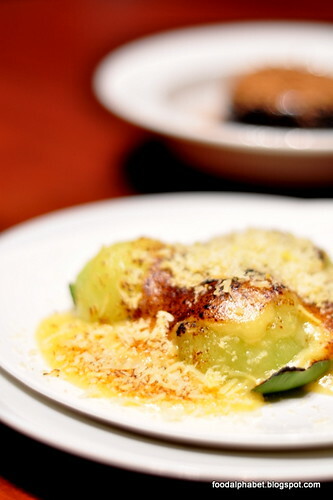 Pandan-flavored cassava dumplings blanketed with custard sauce and covered with quezo de bola brulee, there we have our Pichi-Pichi with Quezo de Bola (P100), oh how I just love the custard sauce as it touches my lips, a better alternative to coconut kutsinta I would say, I would prefer this all the time! 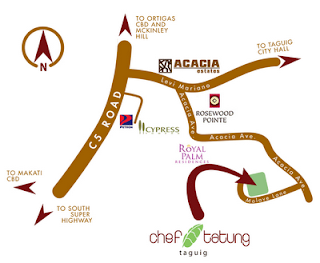 Now that you have seen what Chef Tatung has prepared for all of us, do drop by Chef Tatung at Acacia Estates, follow the map to enjoy a mouth full of bliss made possible only by Chef Tatung.